Doodle Jump. Control your character and jump up a never ending sheet of graph paper shooting enemies along the way. Like the game? Then Let’s Jump! is something definitely worth checking out. An alternative to Doodle Jump, Let’s Jump! works on the same bouncy concept with a slight twist. As such, much of this review will contain references toDoodle Jump, due to the similarities in the games and because I want to draw parallels between the two. 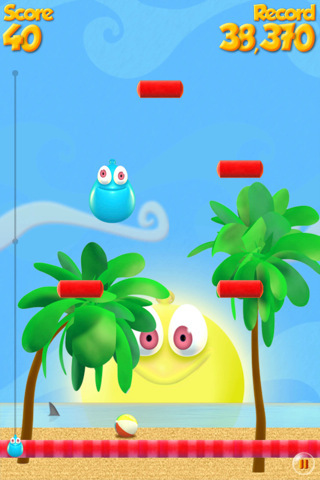 In Let’s Jump!, you take control of a gelatinous blob of liquid. You bounce off platforms, making your way to the top. Why you do so, I have no idea, however, that is beside the point. Although the game does not include alien monsters you can shoot at, it features a slew of different platforms that more or less replace Doodle Jump’s power ups. One platform grants you a boost, propelling you upwards with a short burst of speed. Another one allows you to bounce on it only once. A third will crumble if you touch it, and it is the same color as normal blocks to trick you into crashing right through. The game features cartoonish graphics that are easy on the eyes. You will not have to strain your vision picking out HD rendered objects in the scenery. The scenery is rather simple, providing a backdrop which you simply jump through. Let’s Jump! allows for the background to be changed. You earn new themes by playing the game, garnering points to fill up a balloon that once maxed out, grants you a new gaming scene. What I personally liked about the game was that the developers (No Monkeys) included some sort of a rope to the left of the screen. Through this rope, you can see how far, or close, you are to breaking your high score. It will also notify you once you supersede your average score. There is also a great slow motion effect the game has in place when you set a new high score, reminding me of another game, NinJump from Backflip Studios. The sequence played when you lose the game is also quite appealing, easing the pain of failure. Instead of simply falling off, the blob shows panic on his face, his shocked facial expression as well as the changed backdrop adds to the cuteness of the game which makes it extremely lovable. My only gripe about Let’s Jump! would be that customization is pretty much limited. 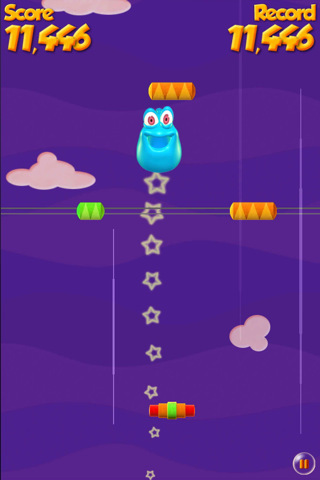 Unlike Doodle Jump, you cannot transmogrify your blob of liquid. It will remain as it is and the most you can do is switch the background to what you’ve unlocked. However, it’s not a deal breaker. Let’s Jump is indeed a worthy alternative to the now somewhat cliché Doodle Jump. In fact, I personally prefer this game to the latter. Simple as it looks, Let’s Jump! will entertain you for hours on end. I suppose the targeted age group would be 9 and below, but Let’s Jump! is set to provide you with much amusement no matter how old you are, definitely worth the 99 cents. You can follow Wei Jie on twitter at @idamnawesome.